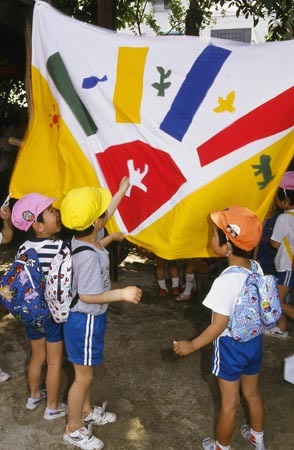 This kindergarden has used energetic flags as symbols for classes and camps since 1988. A kindergardener and the family were struck by an earthquake whose vigor was like "Mud and Sun". When the earthquake happened, the principal of the kindergarden asked me to "please make a flag to cheer up the kindergarden as soon as possible". I'm was glad to help them using my art, which I have been cultivating. I'm glad to help them using my art. I was hopeful that this completed flag would not only receive cheers from the kindergarden, but also from the people of this town.